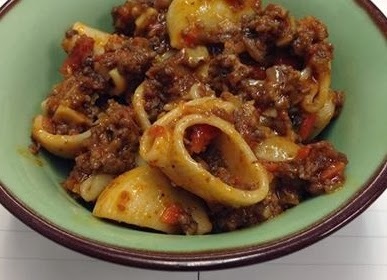 1 pound dried conchigliette, cooked - you can use any other short cut pasta that will hold the sauce well such as rigatoni or mostaccioli. In a large, heavy bottom pot heat the olive oil over medium-high heat. Add the pork and brown well, breaking the meat up in to the smallest pieces possible, for about 5 minutes. Remove the meat to a bowl and reserve. To the same pot add the mushrooms and saute until caramelized, about 5 minutes, scraping up any bits of browned meat, and stirring occasionally. Add the shallots, carrot, and celery and saute for another two minutes. Add the garlic and saute for another minute. Deglaze the pan with the red wine and reduce by half. Add the tomatoes and thyme and reduce the heat to low and cover. Cook at barely a simmer, covered, over low heat for 1 hour, stirring occasionally. Add a a few tablespoons of stock or water to the sauce if it loses too much moisture. Taste the sauce and adjust the seasoning with sea salt and freshly ground pepper. Add the just drained, al dente pasta to the pot with the sauce and continue to cook the pasta along with a tablespoon or so of the pasta water. Cook for a minute stirring to completely sauce the pasta. Portion the pasta in to servings and top each with fresh grated Pecorino cheese, and a few drops of black truffle oil. Serve immediately.